Free Ground Shipping on all orders $50 or more within the continental 48 states of the US! 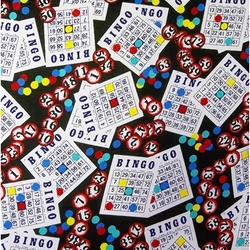 Our classic bingo-themed dauber bag holds up to 10 daubers. Ten dauber sized pockets wrap around the outer edge of this bag. Two beaded drawstrings help to open and close the bag. The pattern shows bingo balls, bingo cards, and plenty of dabs. This dauber bag comes with a complementary matching pouch. Daubers purchased seperately. It is the requirement of the purchaser to know the gaming laws in their specific region. BingoShop.com, and its parent company Integrity Bingo, LLC, is not responsible for upholding the laws in your city and state. Pricing and availability are subject to change without notice. Your shopping cart is currently empty. Please add an item to the cart to proceed with the checkout.